A note arrives from Mark Elliott at International Yacht Collection to say that he's signed the 67.06m motor yacht Allure Shadow for sale. Allure Shadow was built by Shadow Marine in 2007 to serve as a sports/utility superyacht. 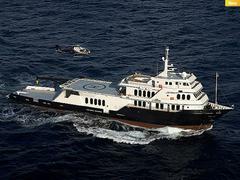 Accommodating 12 guests in six luxurious staterooms, she has a vast range of features including a heli-deck with large hangar, on deck pool, games room, cinema, gym and a skylounge with panoramic views. SOLAS classed and MCA compliant, Allure Shadow is asking $34.9 million.